See The New Magical Movie Poster for Disney's Saving Mr. Banks! 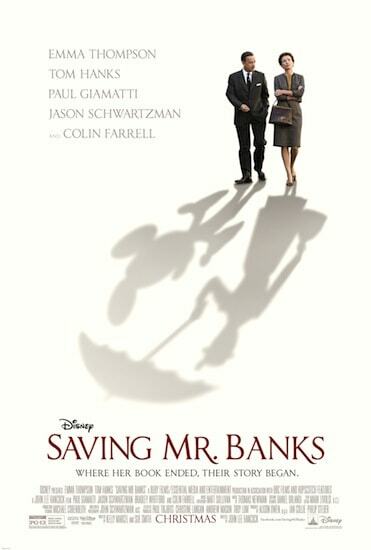 See The New Magical Movie Poster for Disney’s Saving Mr. Banks! The last time I wrote about Saving Mr. Banks I said that it looked like the film was going to be magical. With the debut of this fabulous new movie poster, I know I can't be alone in my thinking! Saving Mr. Banks opens in limited release on December 13, 2013 and opens in wide release on December 20, 2013. Are you as excited as I am for this movie? Two-time Academy Award®–winner Emma Thompson and fellow double Oscar®-winner Tom Hanks topline Disney’s Saving Mr. Banks, inspired by the extraordinary, untold backstory of how Disney’s classic Mary Poppins made it to the screen. When Walt Disney’s daughters begged him to make a movie of their favorite book, P.L. Travers’ Mary Poppins, he made them a promise—one that he didn’t realize would take 20 years to keep. In his quest to obtain the rights, Walt comes up against a curmudgeonly, uncompromising writer who has absolutely no intention of letting her beloved magical nanny get mauled by the Hollywood machine. But, as the books stop selling and money grows short, Travers reluctantly agrees to go to Los Angeles to hear Disney’s plans for the adaptation. Inspired by true events, Saving Mr. Banks is the extraordinary, untold story of how Disney’s classic Mary Poppins made it to the screen—and the testy relationship that the legendary Walt Disney had with author P.L. Travers that almost derailed it. Saving Mr. Banks is the first film to depict the iconic entrepreneur Walt Disney. Mary Poppins won five awards of its 13 Academy Award® nominations: Best Actress (Julie Andrews), Best Effects, Best Film Editing, Original Score and Original Song. Among the nominations were Best Picture and Best Adapted Screenplay. Disney began his quest to get the rights to Mary Poppins in the 1940s as a promise to his two daughters. P.L. Travers’ father was a banker and is the basis for the Mary Poppins story’s patriarch, Mr. Banks—the character in the book whom the famous fictional nanny comes to aid.